Chronically Vintage: There really were 57 varieties of Heinz products! As someone with a melting pot of origins comprising my ancestry, one of my favourite ways for years now to describe my genealogical background is to say that I'm a "Heinz 57 of European nationalities". Of the I've been able to conclusively determine through my genealogical research there's British, French (and French Canadian), German, Russian, Prussian, Polish, and (wayyyyy back) Danish. I don’t for a second that others are whirling around in the mix, too. Many of us have similar backgrounds, made up of ancestors who hailed from various corners of the world, so it comes as to surprise that when I use this term, others have been quick to eagerly adopt it for their own use. I don't mind in the least, and encourage you to do the same, if you'd like. The term "Heinz 57", which appears on many Heinz products to this day, is often used to describe a diverse and/or large group of varying items. For example, you could say, "The buffet at Sally's party was a real Heinz 57 of dishes", or, "My wardrobe is so eclectic, it's a Heinz 57 of styles", and folks would instantly understand that you were describing a mixed bag of items, people, situations or what have you. The origins of this expression lie in a slogan that the famous food manufacturing company used in it early days: "Heinz 57 Varieties of Pure Food Products". Company legend has it that "57" was chosen because the numbers five and seven were of particular significance to Henry John Heinz, founder of the brand. While the company was actually manufacturing more than 60 different products at the time, Heinz like the ring that 57 had to it and opted to use that number as part of his company’s marketing campaign and branding. Heinz products have been on shelves for over a hundred years now and their logo is one of the most recognizable in the world. As such, I started wondering one day, just what were some of the products that made up the yesteryear list of 57 Heinz varieties? If we hop back in time to the 1930s, the following is a list of 57 products that Heinz produced. Many are long gone (despite the more than 5,7000 items the company now produces worldwide), but other classics - like pork and beans, dill pickles, cider vinegar, chilli sauce, and ketchup are still going strong. The etymology of words and phrases has always fascinated me. I love finding out where folklore ends and the truth begins (or vice versa!). 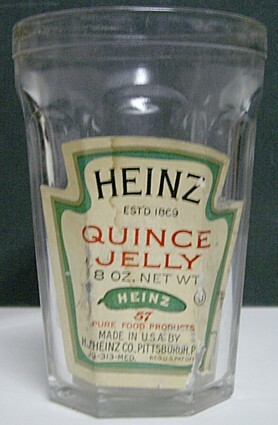 It's lovely to know that Heinz really did have 57 products to back up their slogan back in the early decades of the twenty-first century - and can't help but wish they still manufactured a few of these (how delicious do Quince Jelly and Pineapple Preserves sound?). Whether you consider yourself a Heinz 57 of different nationalities, are a "purebred pup" like my 100% Italian husband, or fall somewhere in between, chances are you've heard of the expression "Heinz 57" before. Now, as beloved radio broadcaster Paul Harvey would have said, you know the rest of the story behind this classic expression and the brand that spawned its usage. I, for one, am off to go find some quince jelly! I think there actually IS a heinz 57 sauce, too, which is comprised of all these sauces? That was where I thought the "heinz 57" came from...a little of everything! Really interesting info here! I gave, what appears to be a pretty old little recipe paper that says, "A New Form of Rice With A New Flavor. Can you give me any idea how old it is? I have 2. Hi there, thank you very much for your question. Do you have any other information to go? Was the recipe handed down to you, did you find it in an old cookbook, etc? I can't date it based on what you provided me with alone, but am happy to try and help narrow down a time frame for it, if you're able to share more with me. In general, the wording there has a 1930s - 40s element to it, but again, I can't say for sure at this stage.